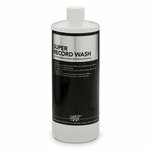 Every serious vinyl fan knows you should rinse your records with tap water. Tap water contains chemicals and microscopic organic matter all of which can be deposited in freshly cleaned grooves. Bottled water comes from either the same sources as tap water or from natural springs which have an even larger amount of minerals. Mobile Fidelity has a history of setting industry standards. 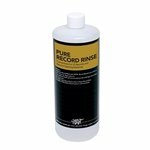 Now, we are the first to provide this extraordinary level of quality in our rinse water. Mobile Fidelity Sound Lab MoFi has been the undisputed pioneer and leader in audiophile recordings since the company's inception in 1977. Established by dedicated audiophiles, Mobile Fidelity's first and foremost goal was to offer faithfully reproduced high fidelity recordings that would compliment the numerous advances occurring in audio delivery systems. Throughout its history, Mobile Fidelity has remained true to this goal, pioneering state-of-the-art technologies and setting audiophile standards that remain in place today.